Many sources of pain and discomfort in the heel area can be easily treated with some common sense methods. For example, by decreasing the rubbing and pressure from poorly fitting shoes, you can treat and prevent heel spurs, calluses, and blistering. In many cases, heel pain will subside with rest and by stopping the activity that is causing the pain, but often the causes and necessary treatment can be much more complicated, requiring a visit to your podiatrist. Diabetes complications—Peripheral neuropathy, which is the name given to the nerve damage often caused by diabetes, can create numbness, tingling, and pain in the heel area. Plantar fasciitis—The wide band of tissue that covers the bottom of your foot is called the plantar fascia and it often becomes injured and inflamed causing severe pain that can radiate to the heel. Injuries and fractures—Experiencing a fracture to your heel bone can happen when you come down hard on your heel while participating in sports, exercise, or work. Calluses and heel fissures—Thick calluses often form on the heel in response to weight and pressure and these can progress to heel fissures that can crack open and bleed, possibly leading to bacterial or fungal infection. The many causes of heel pain can have very similar symptoms which is why you should see your foot doctor for the proper diagnosis and treatment. At Family Foot & Ankle Clinic, our podiatrist, Dr. Stephen Markantone treats a wide variety of foot and ankle conditions including sports injuries, diabetic foot issues, pediatric foot conditions, toe and foot deformities, fungal infections, and heel problems. Equipped with the most advanced technologies and a dedicated staff, Family Foot & Ankle Clinic provides individualized and high-quality care for patients in the North Versailles and Delmont, PA areas. Contact our North Versailles office at 412-824-9370 or our Delmont office at 724-733-3338 to schedule an appointment. Because of the feeling of numbness and the inability to feel pain, patients who have diabetes can be completely oblivious that a cut or blister that has occurred on one of their feet. If these seemingly minor problems are left untreated, they can become infected leading to an ulcerating wound that could progress to the need for amputation of a toe, foot, or even the entire lower leg. Taking care of your feet is a good idea for everyone, and is vitally essential for diabetic patients to avoiding dreadful complications. Inspect your feet daily. This is really the most important thing you can do every day. If you have trouble checking your own feet, use a mirror to inspect the bottom and between the toes or have someone help you. Look for blisters, cuts, ulcers, swelling and redness. Wash and dry your feet at least once a day. Wash your feet every day and dry them carefully, especially between the toes to help avoid fungal and bacterial infections. Trim your toenails, corns, and calluses carefully. 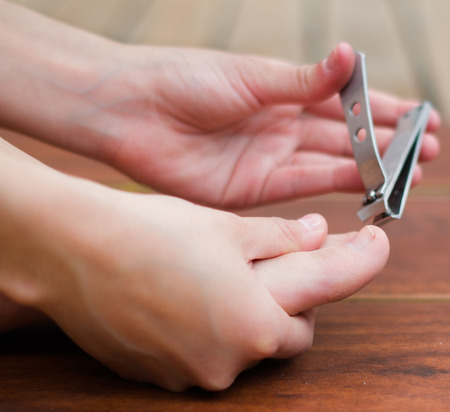 Be careful when cutting your toenails or treating corns and calluses to avoid cuts or scratches. Your podiatrist can carefully perform these tasks to help avoid any accidents. Wear properly fitted shoes. Specially designed diabetic footwear and custom orthotic inserts can help treat wounds and take much of the stress off your feet and ankles. For help with your diabetic foot issues, see your foot care professional. At Family Foot & Ankle Clinic, Dr. Stephen Markantone treats a wide variety of foot and ankle conditions including sports injuries, diabetic foot issues, pediatric foot conditions, toe and foot deformities, fungal infections, and heel problems. Equipped with the most advanced technologies and a dedicated staff, Family Foot & Ankle Clinic provides individualized and high-quality care for patients in the North Versailles and Delmont, PA areas. Contact our North Versailles office at 412-824-9370 or our Delmont office at 724-733-3338 to schedule an appointment. It’s essential to take good care of your feet as you get older to maintain your overall health. Many conditions like peripheral artery disease and diabetes often first show symptoms in the feet and ankles. Having regular visits with your foot doctor can help identify foot and ankle problems before they worsen and can help to avoid pain, discomfort and the need for surgery in the future. Fungal and ingrown toenails – Toenails often thicken and become more brittle with age which makes them harder to trim causing ingrown toenails and fungal toenail infections. Tendons and ligament damage – Your tendons and ligaments lose strength and flexibility as they wear out causing tendonitis, ankle sprains and strains. 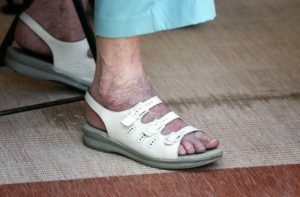 Arthritis – The main joint of the big toe and the ankle joint are two areas often affected first by arthritic conditions. Balance and coordination problems – Complications from diabetes and other illnesses can weaken the ankles and lead to falls. Custom foot and ankle orthotics increase stability and help prevent falls. Skin ailments – Skin lesions are more common as we age and you should always have them checked by your foot doctor to rule out foot cancer. Cracked heels, corns and calluses are also more common as you get older. If you need help treating your old feet and ankles, contact your podiatrist for the optimum care. At Family Foot & Ankle Clinic, Dr. Stephen Markantone treats a wide variety of foot and ankle conditions including sports injuries, diabetic foot issues, pediatric foot conditions, toe and foot deformities, fungal infections, and heel problems. Equipped with the most advanced technologies and a dedicated staff, Family Foot & Ankle Clinic provides individualized and high-quality care for patients in the North Versailles and Delmont, PA areas. Contact our North Versailles office at 412-824-9370 or our Delmont office at 724-733-3338 to schedule an appointment. Bunions are one of the most common toe deformities with nearly half of adults over the age of 65 experiencing the condition at some point. Many younger individuals are also susceptible to developing bunions. Bunion pain and discomfort is characterized by a painful enlargement of the big toe joint with the formation of a pronounced bump on the top or side of the toe. The force of the condition pushes the big toe into the second toe causing a variety of problems including severe pain, corns and calluses, and blisters. Bunions grow rather slowly so you may not notice a problem developing until you are experiencing severe pain. If bunions are untreated for many months or years, bursitis and arthritis may occur in the big toe joint creating a chronic condition that is much more difficult to treat and that may require surgery. Properly fitting shoes with orthotic inserts – One of the most important steps you can take for your foot health is to spend the extra money and time to get a pair of expertly fitted shoes that have proper arch support and wide, deep toe boxes to make room for any needed padding and inserts. Night splints – These supportive devices can be worn at night while you are sleeping. The splint pulls your big toe into a straighter position and helps to realign the joints. Strength and mobility exercises – You can prevent stiffness by doing exercises like picking up marbles with your toes. Scrunching and releasing a small towel with your toes is also a good exercise. If you are experiencing bunion pain and discomfort, see your foot doctor for the proper evaluation and treatment. At Family Foot & Ankle Clinic, Dr. Stephen Markantone treats a wide variety of foot and ankle conditions including sports injuries, diabetic foot issues, pediatric foot conditions, toe and foot deformities, fungal infections, and heel problems. Equipped with the most advanced technologies and a dedicated staff, Family Foot & Ankle Clinic provides individualized and high-quality care for patients in the North Versailles and Delmont, PA areas. Contact our North Versailles office at 412-824-9370 or our Delmont office at 724-733-3338 to schedule an appointment.